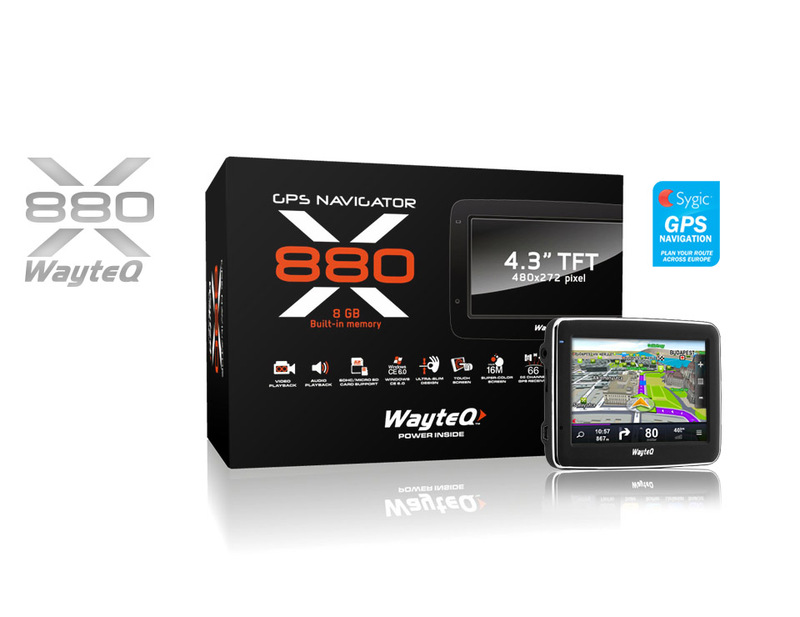 The basic model from new WayteQ navigation series made a lot of progress comparing to previous x850 model. The processor has been changed to the high performance MStar MSB2531 Dual core, Cortex-A7 based CPU, with 800 MHz speed, while memory capacity has been doubled: 256 MB RAM and 8 GB for storage available. Storage space can be upgraded with MicroSD/SDHC cards up to 32 GB. The GPS receiver is a strong 66 channels chip made by MStar, while the desplay is ready to show 16 million colours. The housing of the device stayed the same so every accessory made to previous X820/X850 models (car holder, car charger, case, DC charger, sun protector) can be used. The MStar MSR2112 GPS receiver ensures quick and precise locating and following and able to communicate with satellites through 66 channels. The main CPU is intagrated with a 250MHz coprocessor for calculating GPS datas and a 2D/3D accelerator which is responsible for 3D appearance of the new generation navigation softwares (like Sygic). 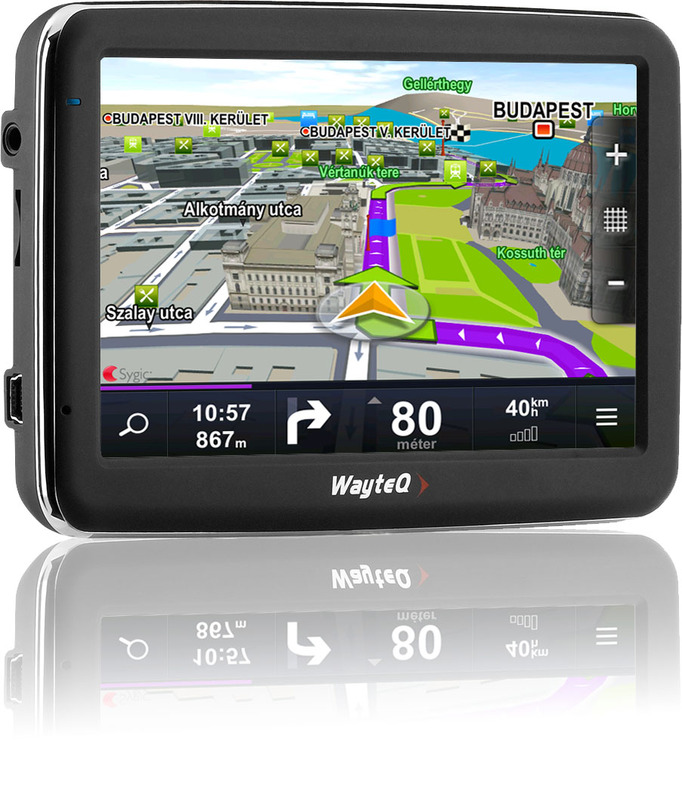 Travelling in Europe is easy due to the pre-installed Sygic GPS Navigation software with Full Europe maps. More information in Software menu! The device includes a 8GB flash memory that can be extended up to 32GB with a microSD card. 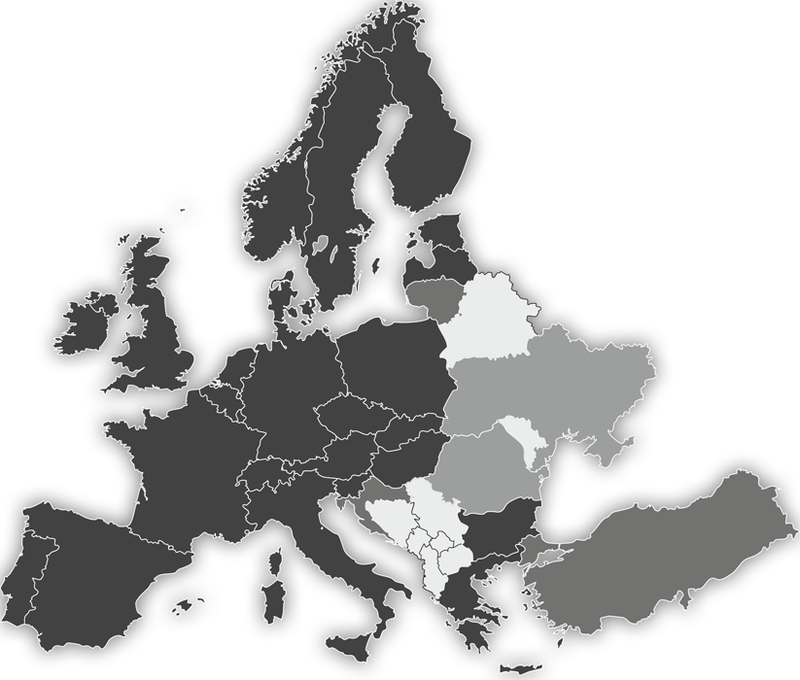 Operational memory boasts an impressive 256MB, which is ample even if planning a Trans-European route with the newest 3D softwares (e.g Sygic 3D). As prevoius models X880 is able to play music, movies, flash videos, show images, open text documents and has installed games. The user intarface can be used on 21 different languages and Windows CE desktop can be opened. Other useful applications like caculator and unit converter also available. x880 has a big advantage: removeable battery. Buying a secondary battery makes it easy to use x850 in places where there is no possibility for charging. Just take out secondary battery and put on the place of the discharged one. So you can use product while sightseeing or hiking. At the end of the day batteries can be charged to make them ready for the next day with full capacity. Sygic GPS Navigation, the real 3D navigation software! On the right side of the screen you can see the most important informations with Sidebar function with spectacular, graphical appearance. Import points of interest from free sources on the internet, adding your favorite locations into your app. Click here for instructions.